While visiting High Adventure Ranch, you’ll be staying in one of our 5 cabins, our lodge, or our new lake house or loft. Costs for each are $150 per night, including all three meals, which are served in the Dining Hall. Or, you can do your own cooking while at the ranch and we only charge $100.00 per night. Hunters 2 nights of lodging & 6 meals are included in the package price. We also offer Family Summer Vacation Package & Big Game Safari Tours, click here for details. 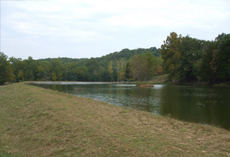 While the majority of our guest’s time is spent hunting, we do maintain a well stocked lake and our hunting guests are invited to try their hand with the quantities of large mouth bass, crappie, bluegill, and catfish at no additional cost (catch and release only and you will need to bring your own tackle).